Adrian and Nuala washing the recovered bikes! We use the bikes every day to do the shopping but also to get fit. In doing so, we have been exploring Chalon by bike. 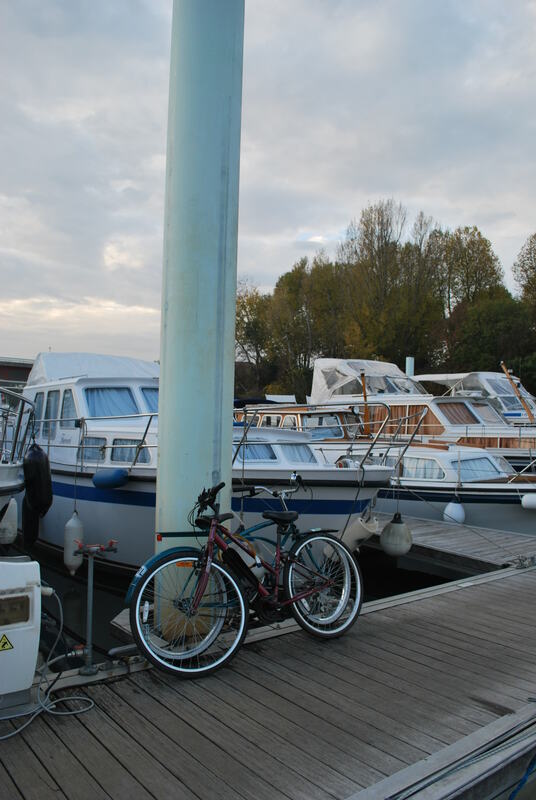 We were warned of the dangers but we decided to leave the bikes, locked up outside the Captainaire (where the public can access) as it saves us pushing them up the steep ramp from the pontoons. On Saturday morning when I went for my usual walk at 7.30 am (I am trying to build back up the strength in my damaged knee), I saw that someone has smashed the lock on the bikes and stolen my Irish bike (the better one). In the process, they had dumped Nuala’s bike, which was locked with it, into the bushes. Thierry the French owner of the boat beside us was very helpful. When I told him of what had happened, he insisted on taking me to the Gendarmerie (police) and reporting the stolen bike. At the police station he put up a valiant fight- pointing out that I was a visitor to France and that they must pursue the thief and find my bike, as it did not look good for France. They promised to see what they could do. I went back to the boat and brought the other two remaining bikes down the ramp and locked them together in front of our boat on the pontoon, inside the locked marina gates. I thought to myself that these ones will be safe and more or less resigned myself to the loss of my good new bike. On Sunday morning Nuala and I decided to go to the city centre. I went out to unlock the bikes and get them ready- no bikes! They had disappeared! Thierry came along and when I told him they were gone he could not believe it!! He worked out, that as the bikes were chained together back to front, it was unlikely that anybody was able to exit with them via the ramp. He went and got a very long boat pole and started to trawl the water around our pontoons. Low and behold he found our bikes in 16 feet of water. We managed to haul them out. After a good wash down and oiling, I think they will be ok as they were in the water for only about nine hours. 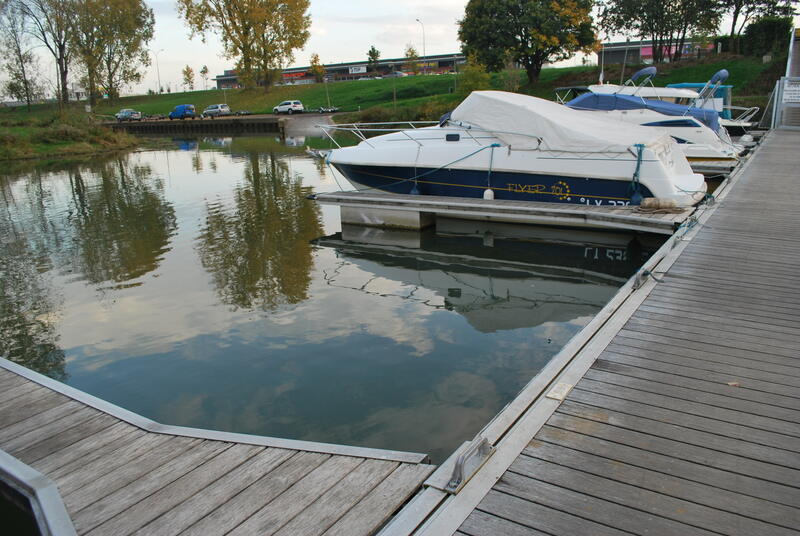 A number of other boaters came along and heard the story – they were all helpful and sympathetic. The general consensus was that a boat had arrived late yesterday evening with a load of young guys, who got drunk and were dancing and running up and down the pontoon during the night. It is expected that they must have chucked our bikes into the water. But that does not help us. We have almost lost three bikes in 24 hours! This is the first time in seven months of travelling throughout France and Germany that any of our belongings have been stolen or damaged. It’s a pity it happened in Chalon. Once again when something bad happens, what does help is the reaction of good people like Thierry who help compensate for the damage that bad people do! This entry was posted in Adrian injury, Comments on Social Economic Lifestyle in France, Experiences on the Canals, On the Journey, People who have helped us on our way and tagged bikes, Chalon, Violence in Chalon. Bookmark the permalink. 6 Responses to Chalon sur Saone- The dream took a bit of a battering this week. Ah you poor things.. well at least you got two of the bikes back .. so it wasnât a total disaster..
great to hear from you. I hope Rog is ok. We will be more careful in future! We have had 7 months of travel without any issues and it made us complacent. Must be a good trade in France in stolen bikes! Yes, it seems all too common here – and it isn’t just the good bikes! 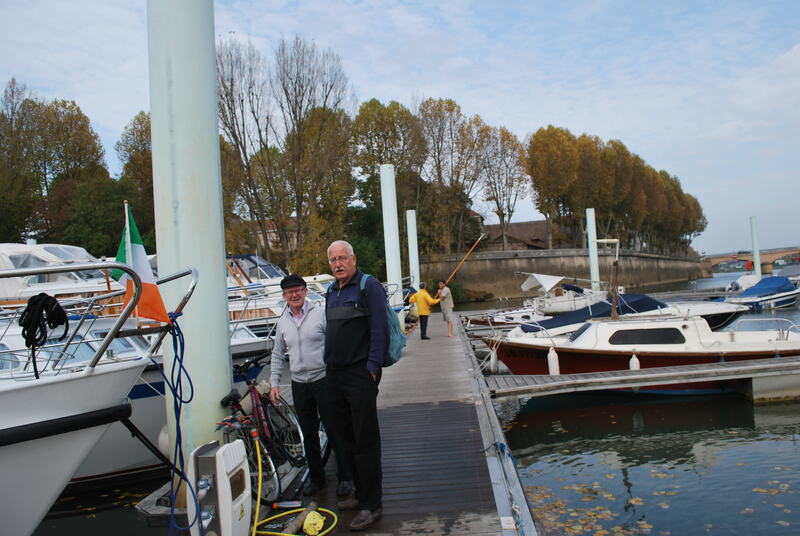 We lost an old locked bike which for convenience we left out one night beside the boat on the Marne. We have a rule now that the bikes must be on the boat and locked to something solid on the boat – because they get lifted off boats too! A boater here at Vermenton just lost 2 bikes locked beside his boat and at Auxerre our neighbour disturbed thieves on his boat about to make off with his bikes in the middle of the night. At least then one can make it difficult for drunks! good to hear from you. Yes we had got complacent because we have had 7 months of travel without any issues. We have learned our lesson. Pity we had too.